Wondercon was just as exhilarating as it was exhausting! 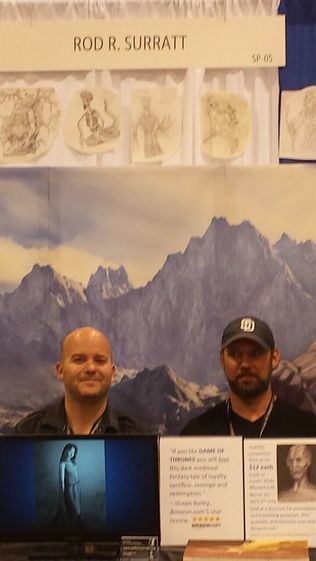 My second day there, my business partner/sketch artist/Irish Brother From Another Mother/best friend since 1st Grade Shawn Bailey glanced at my bloodshot eyes as I watched the Cosplay Peeps strolling, marching and sometimes even skipping past our Small Press Table in Hall A and asked, "You okay, man?" "I totally love these people, bro," I smiled back, and I meant it. "They put forth a hundred times more effort into their get-up than you see on even the most inventive person on Halloween. It's like they prepare for it all year. These are our people. You know what we all have in common? We're all bored with reality." I have nothing against folks who find great relaxation fishing for hours, or who prefer watching pro football or CNN instead of Saw 3 and Game of Thrones. I just don't have much in common with them. 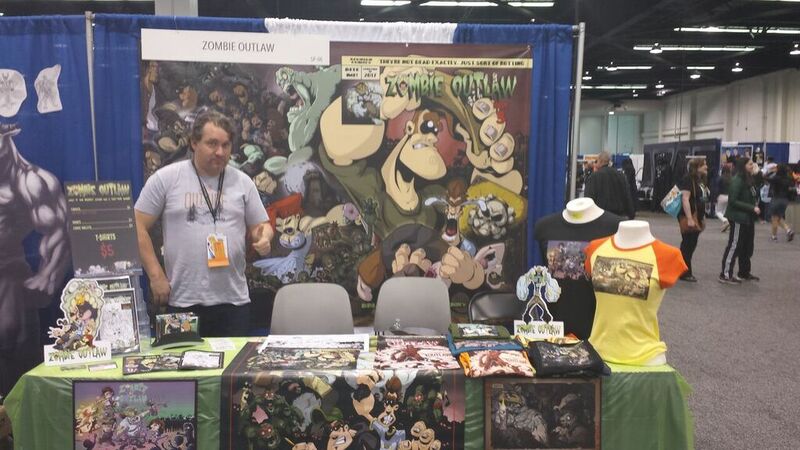 Wondercon was a wonderful "trial by fire", promoting SHARDS, networking with new artists and engaging in some of the strangest conversations I've ever had about every topic from Stanley Kubrick's afterlife to why any institution of higher education would choose the banana slug as its mascot. Here's my Small Press Table. By the second day I'd learned to use my small space to it's maximum potential. Overhead we've got Shawn's sketches of the Gods of Shards, standing pretentiously over the Boar's Head Mountains, flanked by Lisa Clarks's rendition of Calypso and Grendel, which I ordered as standees from "Shindigz." On the table we've got the book open to a random page, a power point that scrolls through about a dozen character sketches, business cards and some conversation starters: pictures and quotes from Jesus, SS Gestapo General and Chief of Reich Security Heydrich and what table would be complete without Confucius? When people asked why I put the King of Jews right next to the perpetrator of the Holocaust, I said, "That's what my novel is all about. The sublime juxtaposed incessantly with the grotesque." A bit blurry, sorry. I like Shawn's calm but shifty eyes in this picture. It pretty much sums up his opinion of the entire Wondercon experience. In his own words (literally his own word): "Shmeh". I mean, what more do you need? That word is like "Dude". It can be used to express any emotion or contention - it sums up the entire human condition. It is the perfect word to describe the entire 21st Century. Shmeh. May Anthrough-Genus shed his light upon thee, dear brother. And give thee peace. Shmeh. Amen. Zombies are the new vampires. Thank God. Vampires are just about the most boring mythological creature there is. I understand why the ladies love them. As far as the undead go, they're considered the most romantic. As far as fornicating with them goes, I can gather why most women don't really consider it necrophilia. Rotting, resurrected corpses with morning breath and one eye dripping out of their sockets just don't share that seductive quality as what's-his-name from Twilight. But really. I think Hollywood has exhausted every possible story line from Count Chocula. The only vampire movie I ever cared for was Kathryn Bigelow's (yes, that one) Near Dark, and that movie with the late and great Bill Paxton (nice guy - I met him on the set of Mighty Joe Young) was certainly not romantic. Bigelow's a genius. She's got the Midas Touch when it comes to film-making. Anyway, quoth the rambler, this is my new buddy Brian on the left (above) - writer of the intriguing new tribute to our worldwide obsession with the undead: "Zombie Outlaw." Brian, the writer, Benny the artist (not invisible, just out of frame) and their business partner Ray were the coolest people I met at Wondercon. Ray kept me alive and on my feet with "5 Hour Energy" bottles. Brian and I waxed philosophy and mythology. They made me feel right at home and Zombie Outlaw has got a bright future. I can feel it. 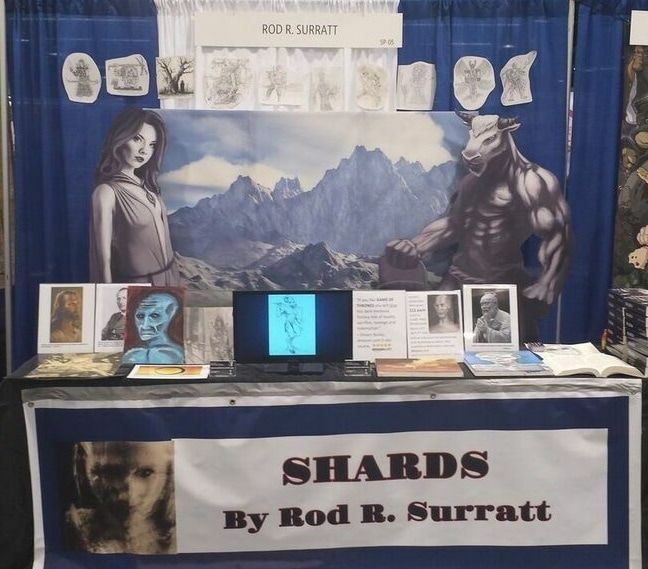 Check out the "Character Concept Art" tab for an incredible rendition of a Clayface Carrier (of Shards) that Benny created for me as his business card....in 15 minutes. Again, three very cool guys that I hope to see again. You gotta love the cosplay people. What I admire most about them is that so many of them have costumes that are so cumbersome, or spandex with no pockets, or they have both hands full of rifles, giant sledgehammers or Dead Space mutants, they can't possibly be there for commerce. Like Kevin Smith's ad copy on the top of Mallrats: "They're not there to shop. They're not there to work. They're just there." 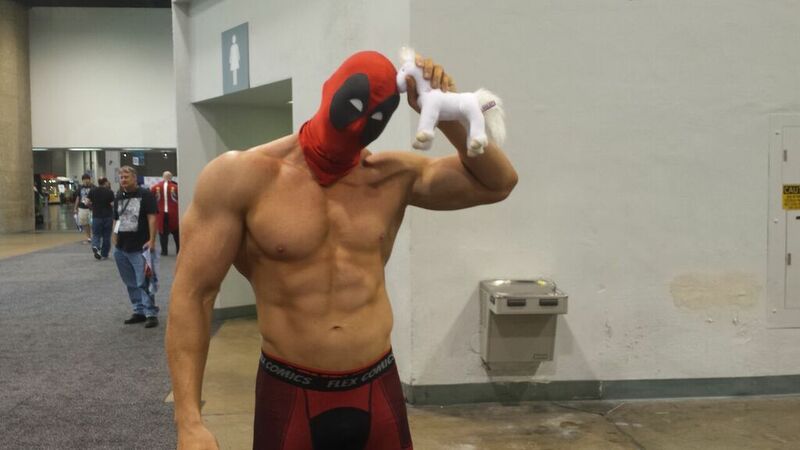 They are your fondest memories of any Comic-con. For two guys like Shawn and I, who wish Halloween was once a month, they are the best part of being an exhibitor. They mutate and alter our most recognizable popular culture characters to the point that you don't know what will come around the corner - ever. They always surprise you and you've got to love them because they are the most positive energy of the show. *******That being said, let me offer this DISCLAIMER/Cuidado/Les Enfantes Terribles: The cosplay peeps pictured here were my faves from Wondercon. Should that be you, and you'd prefer not to be featured here, I'll immediately remove it. Just contact me at rodrsurratt@yahoo.com. But the way I see it, the work you put into your presentation deserves to be celebrated. Shawn might look short in this picture but he's 5' 10". 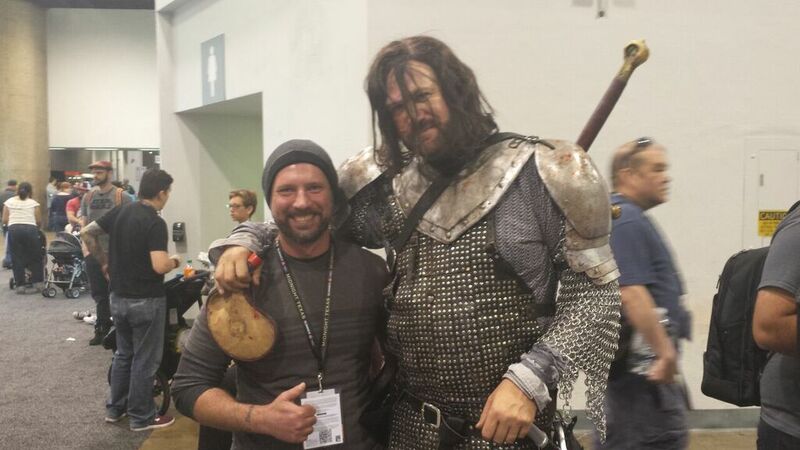 He only looks short next to this very friendly Clegane (AKA The Hound) who was at least a full foot taller. Very cool guy. I only wish I had taken a second picture from the other angle, because his burn scar (the one Clegane received from his monstrous older brother) was wonderfully accurate and beautifully crafted. 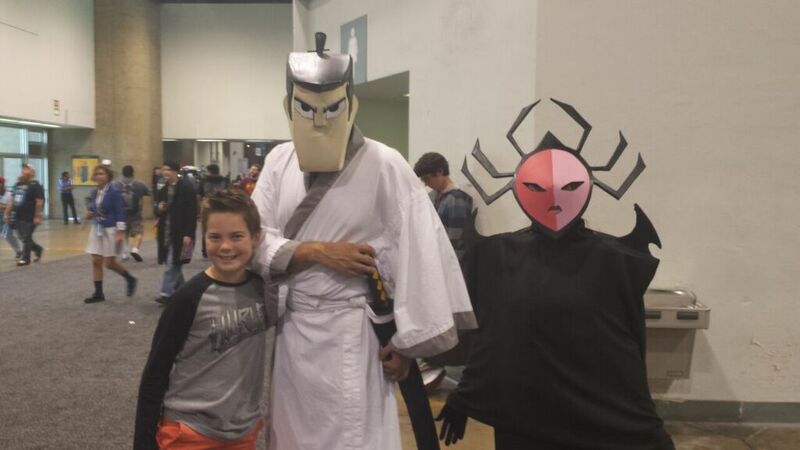 Here's my eldest posing with Samurai Jack and Jack's buddy. Samurai Jack - I never saw the TV show but Mason liked the movie when he was younger. It's not NINJA SCROLL, but pretty good as Japanese cartoon movies go. I remember thinking while I was driving, and Mason would watch the movie on a DVD player in the back seat: "This script must have been a difficult read through," because it seems to have less than two dozen lines of dialogue. Voorhees and Krueger really knew how to strike a pose. What's more, not only is Freddy's costume spot-on... that's not a mask. It's latex and he's got it on his hands, neck and face. It even appears to have been sculpted in the likeness of Robert England. That's dedication, man! Shawn and I were wondering after he left - did this guy pull of this awesome Nightmare on Elm Street icon for just one day, sleep under that latex for two nights straight, or did he remove it and reapply it in the morning? Whatever the answer, you've got to admire this guy's astronomical commitment to the convention. Both of them, really, because if you looked at Jason from the back, he had the grey tint of a corpse and bulging veins on his shaved head and neck. This quartet was so damn cool. People have such awesome powers of imagination. I mean, look at these mutants! 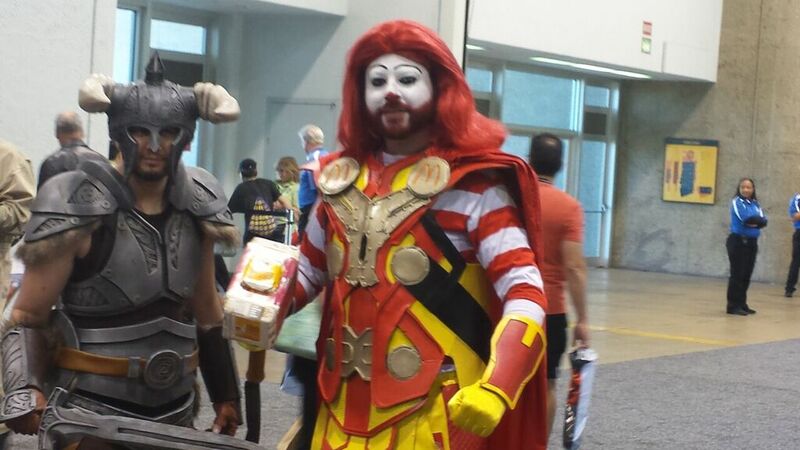 We've got Joker-Boba-Fett, Harleyquinn Princess Leia, but gods above, a Ronald Mcdonald Thor!? Mickee Dee's should be calling this dude to be their new icon. 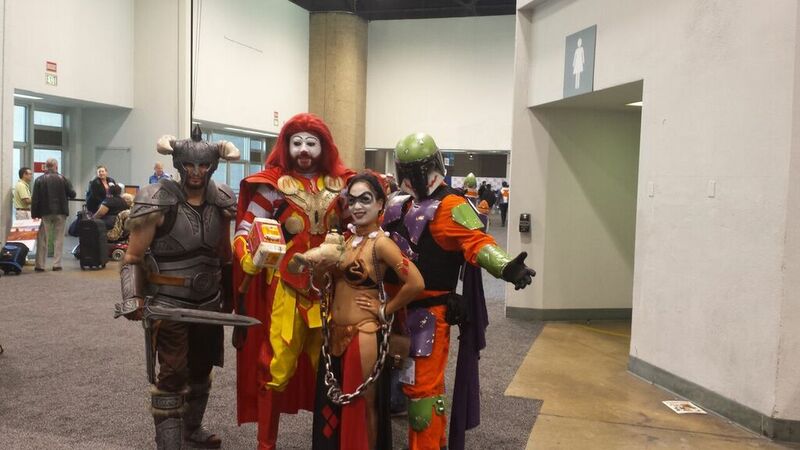 Whoever thought cosplay could make Ronald McDonald look cool? In the Wondercon '17 costume contest, if they had one, this guy wins hands down in my book. So cool I had to mount his pic twice. And the other dude made me want to go home and watch our former Governor in Conan The Barbarian. "Two snakes, facing eachothah! But dehr one!" For once my phone camera took a non-blurry photo at the exact moment that a cosplay peep was making his awesome pose. I'm lovin' the battle scars on this Mad Max barbarian. I have since been corrected by two people that although the overall motif is reminiscent of Mad Max, the weapon suggests the game franchiseBorderlands. 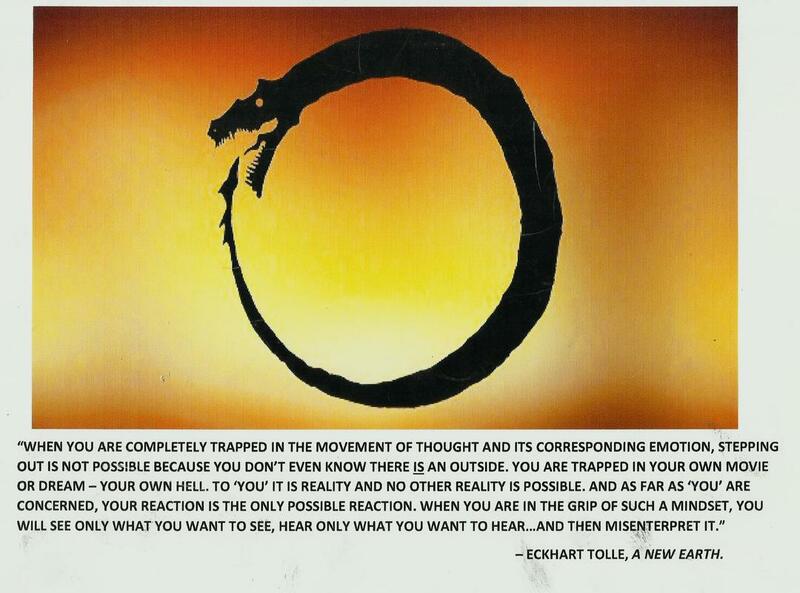 This Ouroboros pic, which, in SHARDS, is the symbol of mankind's endless cycle of perpetration and retribution (I know it has various interpretations) was on my Wondercon table as a Conversation Starter, along with the Tolle quote. Tolle was the strongest inspiration for all spiritual aspects of SHARDS, especially Grendel's character arc.